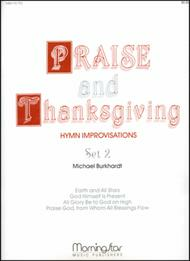 Praise and Thanksgiving, Set 2 composed by Michael Burkhardt. For organ. Thanksgiving, Praise/Thanksgiving. Medium. Published by MorningStar Music Publishers (MN.10-752).Includes:All Glory Be to God on HighALLEIN GOTT IN DER HOH Earth and All StarsEARTH AND ALL STARS Praise God, from Whom All Blessings Flow OLD HUNDREDTH God Himself is PresentWUNDERBARER KONIG.